Starting a new craft can be daunting for many people. 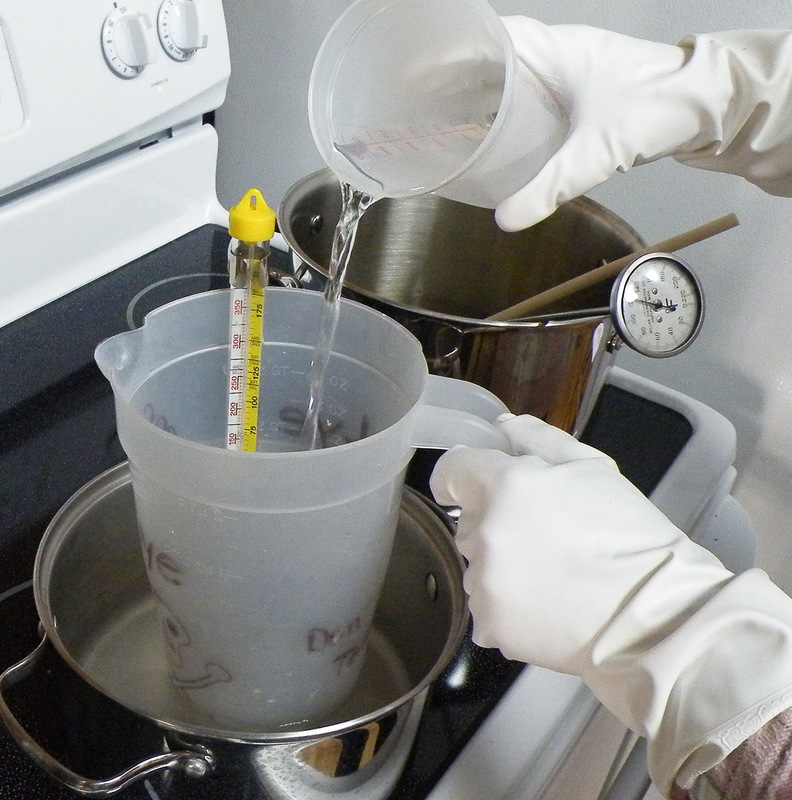 This long article addresses the basic concerns in soap making. Likely reading it once or twice will be enough. The method and recipe are easy and the results are consistently good. Why bother making your own soap? Many reasons. Anyone can easily make a small simple batch that will turn out 6 to 12 bars of good soap as needed. My main reason was to control the materials I used for bathing, laundry and cleaning to cut down on unnecessary chemicals that are polluting our environment and bodies. Soap is such an ordinary object many of us don’t think about it until we develop allergies to one or more of the ingredients. Yet our skin absorbs substances which then are either used by our body or have to be eliminated through our bloodstream, kidneys or back out through the skin. Using simple soap made with ingredients we choose helps reduce the toll on our body to eliminate materials that are either not needed or may be harmful. Homemade bar soap provides about the same satisfaction as making a tasty batch of whole grain bread from scratch, except that the soap seems to last longer. 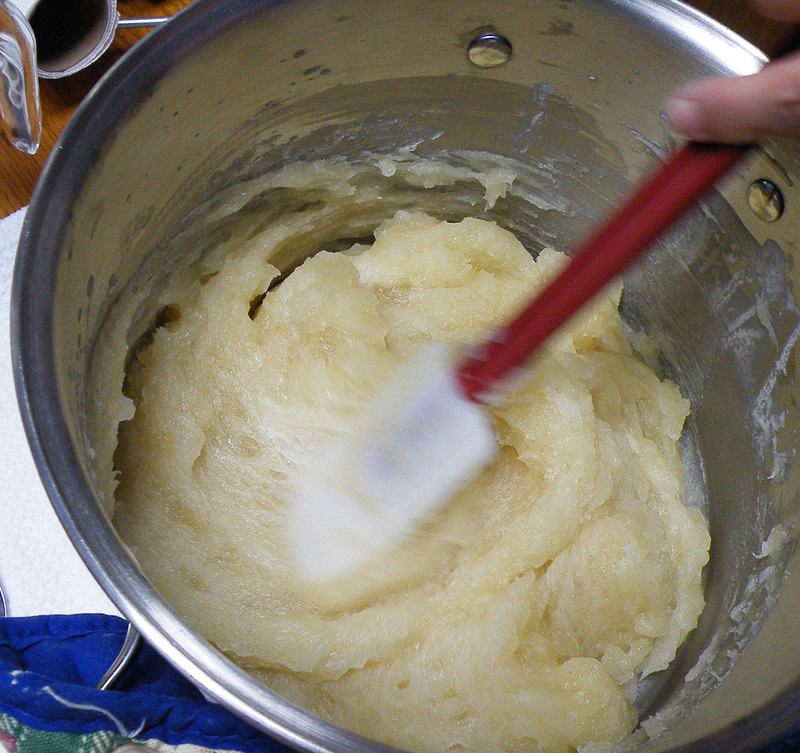 Soapmaking in my family goes back through the women, though all of them used animal fat as the basis of their recipes. Eagle or Red Devil lye crystals provided the powerful caustic chemical base that reacted with the fatty acids to form soap. Today’s soap makers however have to rely on purchasing lye crystals online as stores no longer carry it since it is used to make illegal drugs. Locally some specialty hardware or farm & home type stores may order it for you if you ask. A list of resources follows this article. Lye can be considered as essential to making bar soap as leavening (yeast) is to making raised bread. A myth exists that soap made with lye harms the skin and at the very least should be avoided. The fault is with the recipe not the lye. In fact “lye” chemically known as sodium hydroxide provides the reaction (called saponification) which results in what is called “soap”. The FDA acknowledges that only products made using sodium hydroxide in reaction with fatty acids can be called soap. Many “bars” of something that looks like soap on store shelves are called beauty bars or other similar names. But read the labels and the word “soap” does not appear, nor will sodium hydroxide show up in the ingredients. Responding to the myth that lye soap harms the skin, some soap manufacturers avoid putting it on their labels. In fact no requirement exists for putting lye/sodium hydroxide on the label because the word “soap” on the label implies its use in the production of soap. Words ending in “ate” in the ingredients listed on bar soap labels indicate the substances which reacted with the sodium hydroxide to make the soap. Some examples are: Sodium tallowate (beef fat rendered into tallow reacted with sodium hydroxide), and sodium palmate (palm oil reacted with sodium hydroxide). One popular inexpensive but very good soap lists just “coconut soap” as the first ingredient followed by “water, other oils and fragrance”(Kirk’s Original Coco Castile). Most people might not realize that “coconut soap” means coconut oil reacted with sodium hydroxide. The truth: No lye, no soap! See www.millersoap.com for much more information about lye and soap ingredients for the soap maker hobbyist. 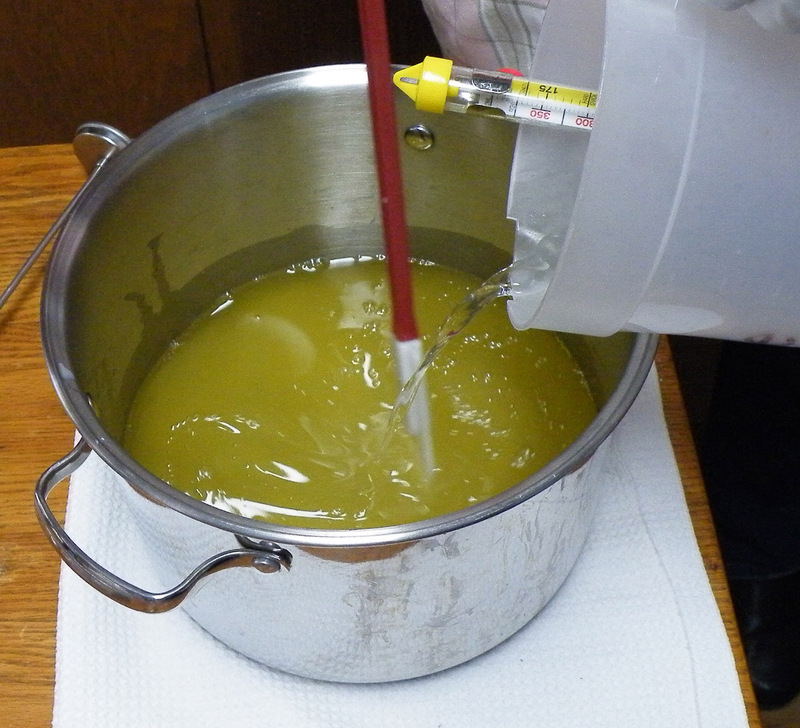 Making safe soap means using more fat or oils than the sodium hydroxide needs to be completely reacted (used up). When this happens there is no more lye left in the soap mixture so a tiny dab of it on your tongue will not leave a stinging zap, just the bland mild taste of soap. The tongue/zap test is one way that we soap makers sometimes check our soap to see if it is “done”. There is no doubt when one is zapped, or not. Specialty pH strips are also useful. Again see www.millersoap.com for a more complete discussion of the pH strips and a source if you want to use them. I did use them initially but once I knew what to expect from the materials I constantly use I stopped using them. The soap should have a small percentage excess of fat or oils. Too much fat or oils makes a soft soap or the soap may not set up. Some soapmakers add extra oils after the soap is finished, called superfatting, which can result in a softer soap, but it is very rich in moisturizers and wonderful for the skin. Too much lye makes the soap harsh, dry, brittle, and crumbly. 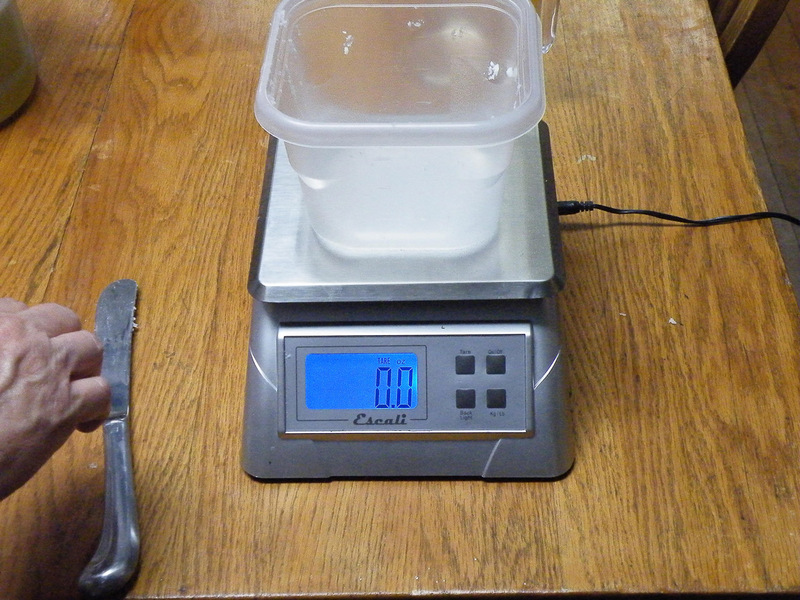 So the key to making safe soap lies in balancing the lye to fat/oil ratio. Today each fat or oil commonly used in making soap has something called a sap (saponification) number that has been thoughtfully calculated for us by some zealous chemists. See the miller soap website for more information about this. These numbers refer to the amount of lye needed to turn a given amount of fat or oils into soap. 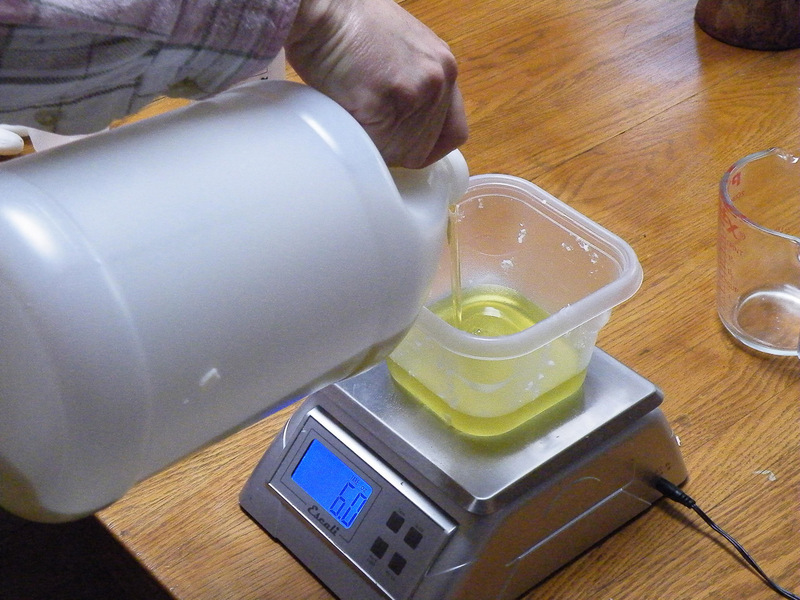 A soap recipe should consider all the sap numbers for each fat or oil used as these also indicate how fast or slow the soap will be in tracing (thickening). In designing a recipe the goal is to use ingredients with sap numbers near each other. 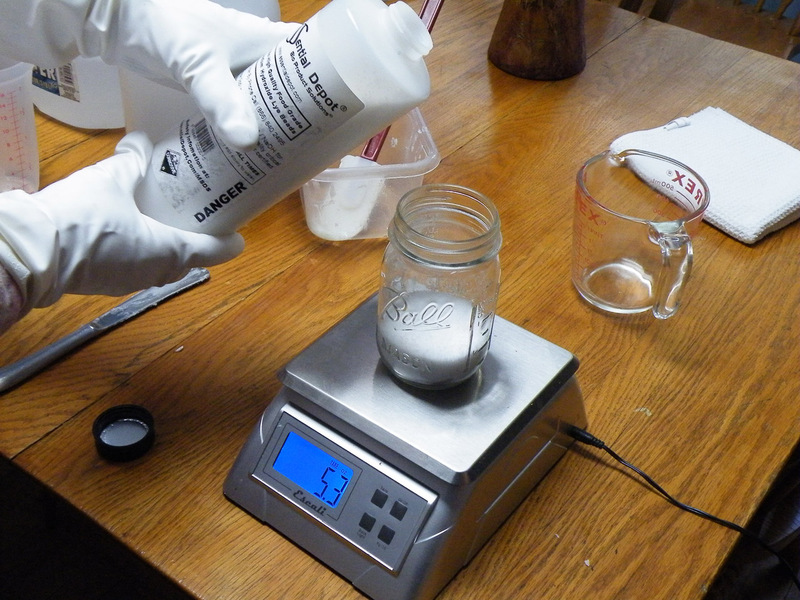 Today’s soapmakers are fortunate to have several “lye” calculators available on the internet. These programs take the tedium out of figuring percentages for fat/oils and lye. 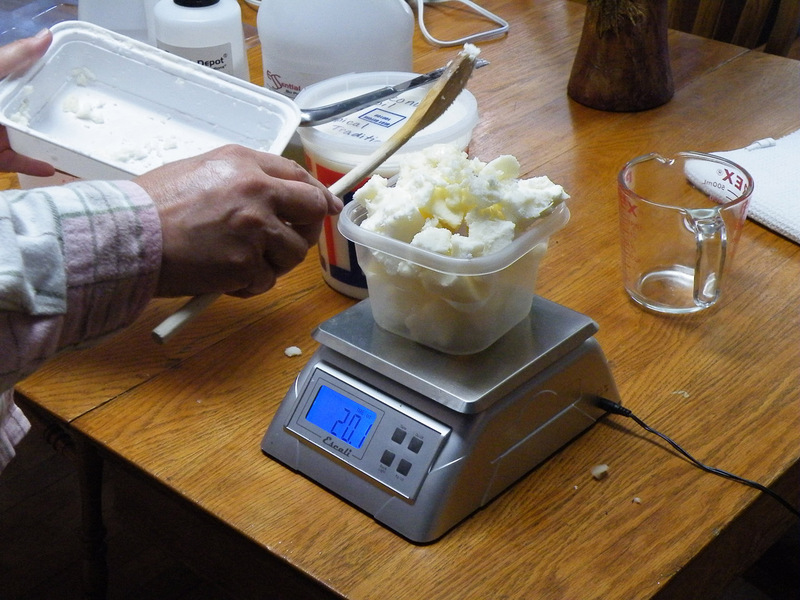 My favorite one MMS Lye Calculator makes the creation of new soap recipes easier. The website is http://www.thesage.com Look for the “lye calculator” listed in the menu to the left of the home page. 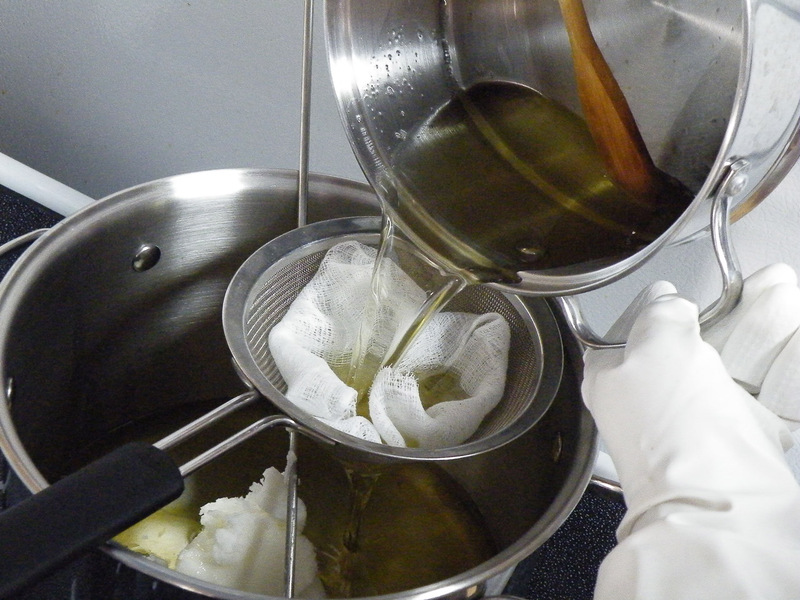 Before deciding upon which fats or oils to use however, do some research into the qualities of each oil or fat to see if it provides what you need, or just to see what you can expect from the finished soap. For example castor oil helps a low sudsing fat like tallow lather up. So will combining tallow with coconut and olive oil as in this recipe. The recipe in this article is complete and the reader does not need to check it out with a lye calculator as that has been done. It also provides a “Lye Table”. This extremely valuable table would have saved my grandmother, and my mom, a lot of grief. The recipes they used were on the old lye cans which when followed often produced different results with each batch. My first and only attempt using the recipe on the can produced a toxic batch that looked like a mad science experiment. Safety issues with lye are serious. Lye crystals or lye water (crystals dissolved in water) will immediately severely burn skin or eyes. Please do not make soap unless you have a quiet clean and safe place which will not be subject to surprise visits by others, especially children or pets. Do not even answer the phone as you can accidentally knock over a lye water container. 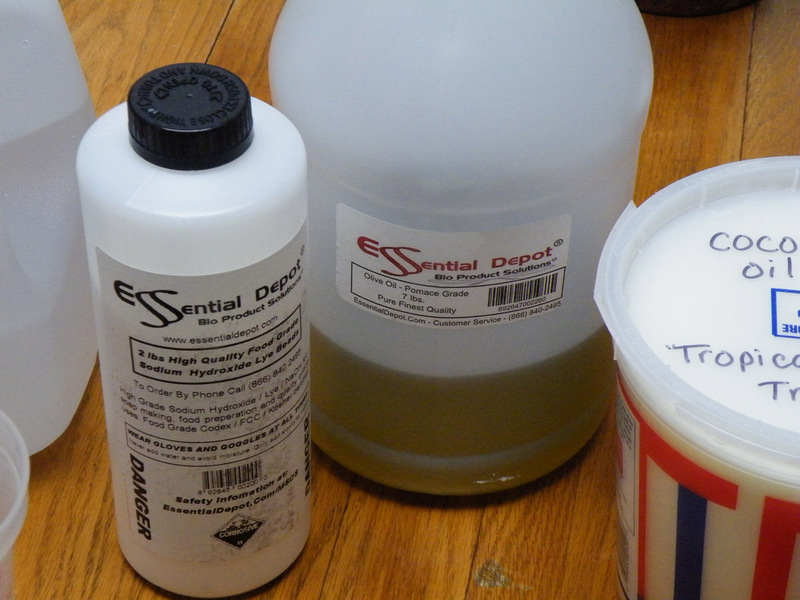 It is important to not be distracted at least until the lye water and fat/oils are safely mixed. 1. Vinegar – A spray bottle with vinegar (I like cider vinegar). Vinegar will immediately neutralize the lye crystals or lye water. In the event of a spill immediately spray the vinegar liberally over the lye water or crystals. Wear plastic gloves to wipe this up. If the lye crystals or water splash onto bare skin immediately flood with the vinegar. Do not try to wash with water until the vinegar has been able to neutralize the lye. Seek medical attention quickly if eyes or mucus membranes have been affected or the skin shows a burn. Do not underestimate the seriousness of a lye burn. Keep things in perspective. If you are normally a careful person likely you will be careful with lye as well. If you tend to take unnecessary risks think carefully about how you will proceed using lye or even making soap at all. 2. Plastic gloves – heavy duty plastic gloves that resist chemicals and heat can be found in the house cleaning supplies section of the grocery store. Wear these when working with the lye from the time you open the lye crystal container until the lye water safely combines with the fat/oils and the soap nears completion. 3. Safety glasses: this pair has prescription lens from a former job I had in an industrial environment. It has eye shields on the sides. Look for safety goggles wherever paint supplies or hand tools are sold. The goggles must cover the entire eye, front and sides. 4. Fumes: When lye crystals combine with a liquid such as water or milk strong toxic fumes and vapor are produced as the liquid heats up to near boiling. A dust mask helps to filter out the strong smell and protect your nose. Provide ventilation from open windows and a gentle running fan in all areas if others are in the home or upstairs. When I am alone I find that working at a comfortable arm’s length is sufficient to avoid the fumes with adequate room ventilation. When I first started making soap I worked with the lye crystals outdoors. The fumes decrease rather quickly as the lye water cools down and are not noticeable unless you stick your nose near the container. In Photo 20 I have a small cold pack shaped around the lye water pitcher in a pan of cold tap water. I don’t use ice because I don’t want to cool the lye water a lot. For cold process the recipes state to aim for 95 to 105F for the lye water and no more than ten degrees above that for the fat/oils. For hot process oven method those temps can be higher. 5. Protective clothing: This is needed in case of a lye water or raw soap splash. Wear a long sleeved heavy shirt over your regular clothing and pull the plastic gloves over the end of the sleeves, or cuffs. Wear heavy pants or trousers such as denim. Wear heavy socks and shoes that cover the entire foot. A plastic apron is also a good idea but with all the heavy clothes on I have been skipping it as it then makes me really warm. Have your hair securely in place. Wear the safety glasses or protective goggles at all times that you are wearing the gloves. 6. Organize and cover working surface: (Photo Soap 2) Splashed lye water or raw soap will damage many surfaces especially wood. If you are concerned about this cover the working surface with newspaper, freezer paper or an old table cloth. My work table has souvenirs from years of craft projects and a few more marks does not concern me as much as using paper that will be discarded. 7. Do not skimp on safety, understand the risks, but just as we have learned how to handle fire and gasoline safely, handling lye safely has been done for a long time by many people. Lye containers are labeled with the safety precautions as well. (Photo Soap 3). 1. Measuring Scale.The photo above shows an Escali electric (or battery) digital scale with a 13 lb capacity. These are not cheap but if well cared for are worth the investment. 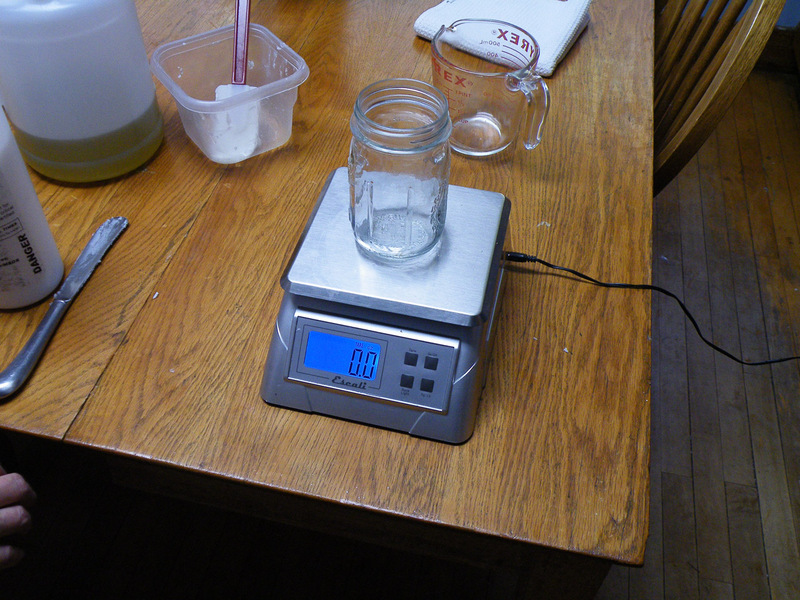 Lye amounts in soap making recipes are given in tenths and hundredths of an ounce by weight, not by volume. The Escali scale is easy to use but only measures to tenths of an ounce. This works fine however, just don’t be hasty measuring lye crystals. And be sure to wear gloves when doing so. A postal scale could also be used. All ingredients except water, are measured by WEIGHT. But if you forget and weigh the water don’t worry. As the old adage goes: “ A pint is a pound the world around”. When I forget and weigh the water it hasn’t made a noticeable difference in the resulting soap. 2. Thermometers. 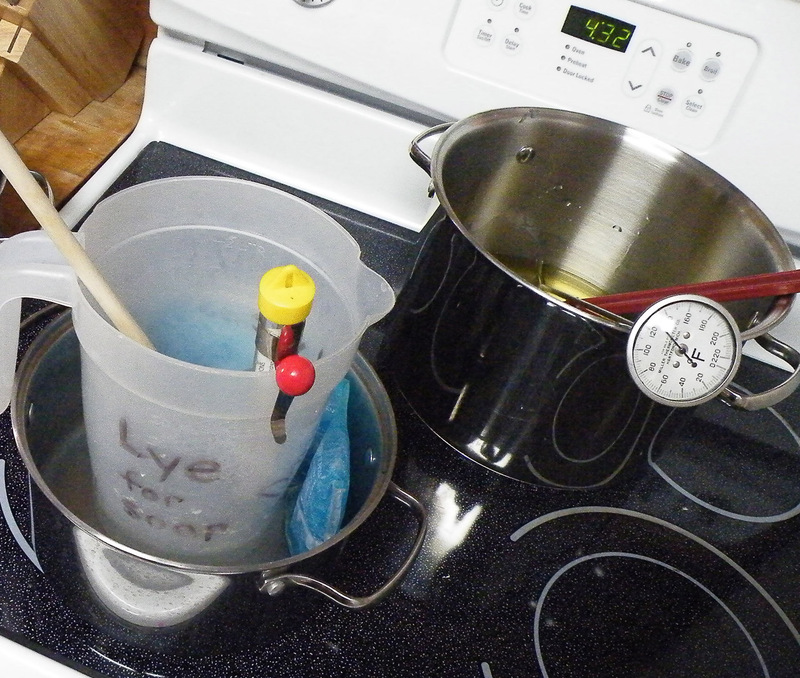 Use a candy thermometer that clips onto the lye water container. I’ve not found one that will stay on the side of my kettles so I use a long stemmed one from dairy supply stores used to make cheese. It sometimes flips out of smaller kettles. Avoid boiling either the lye water or the fat/oils. When the temperatures of either head toward 190 degrees F pull the fat/oils kettle off the heat and add cold water around the lye container. (Photo Soap 20). If the cooking soap (later when you put it in the oven) gets too hot the lye water in it will make the mixture foam up. It can spill over the kettle onto the oven heat elements and rack. If you see the mixture starting to foam remove it from the oven and stir it briskly until the foam goes down. Return it to the oven for the rest of the time. So be aware of the temperature at all times. Use an oven thermometer to check on the accuracy of your oven. 3. Heat Safe Spatula, stainless spoon. Today silicone spatulas are available that are heat resistant. These are great for mixing the lye crystals into the water and for mixing the lye water into the fat/oils, and the final mixing of the soap after cooking. Wooden spoons will work but with repeated use the lye will erode them, especially bamboo spoons. Use wood or bamboo for melting the fat/oils. Metal spoons such as from canning supplies are good as long as they are stainless steel. One batch of mine got too hot though and the stainless spoon discolored from the hot raw soap as the lye was still active. For most efficient blending when the soap mixture gets really thick and heavy a broad spatula or spoon works best. 4. 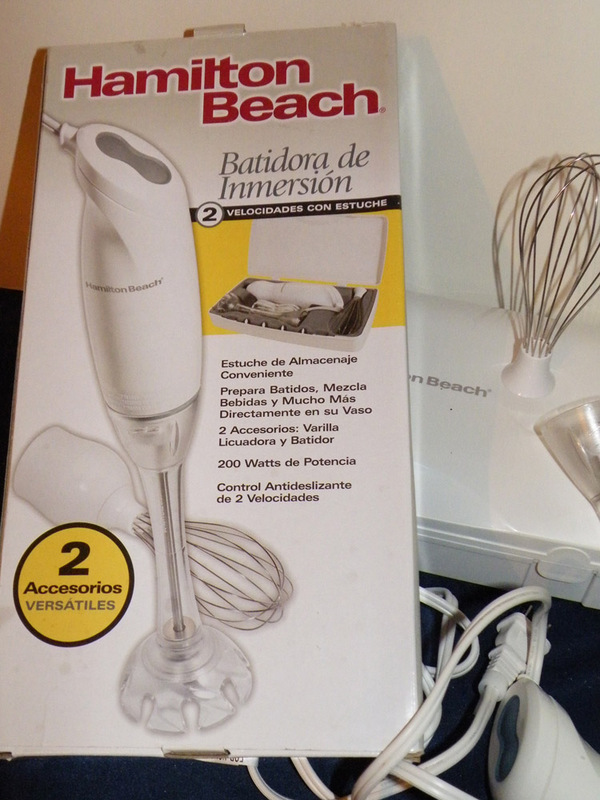 Hand blender.This handy gadget made by Hamilton Beach ranged in price from $18 on sale to $26 and is readily found in stores with kitchen appliances. I also found a used one at Good Will for much less. This one has detachable attachments which make it much easier to clean. The attachment to use is the one with the covered cutting blade. 5. Stainless Kettle. 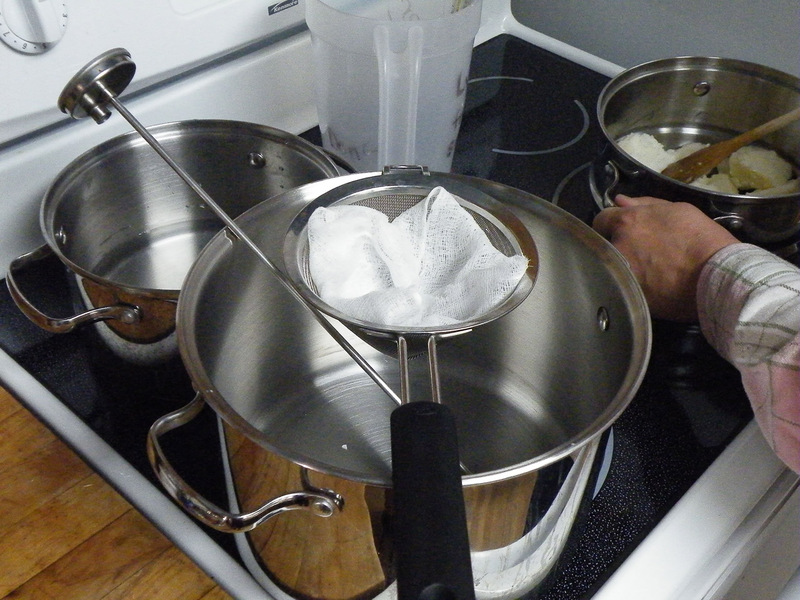 I use a heavy gauge stainless 8 quart kettle for the actual soap mixture, and a smaller stainless kettle for melting the beef tallow before I strain it. If you wash your kettles well after making soap you can use them for preparing food. After all you wash them in dish soap. Do not use any other kind of metal. Porcelain coated steel can be used as long as there are no cracks or spots where the porcelain is missing. Look for a “stock pot” where home canning supplies are sold, or in a farm supply store where dairy equipment is sold. I found nice stainless kettles at local stores for under $30. 6. Lye water container. Plastic heat resistant container for lye water, or a pyrex pitcher. Rubbermaid makes the plastic pitcher. Caution. For small amounts of water, under a pint, the pitcher may not stay upright in a pan of cold water. I prefer cold freezer packs because they are quicker and easier to place and remove than ice cubes. The deep pitcher however allows for the ferocious bubbling and heat that the lye can cause when added to water. I feel that plastic is safer in this case than using pyrex which might shatter from the contrast between the rapidly heating lye water and ice packs or ice water around it. 7. Cheese cloth and stainless strainer. 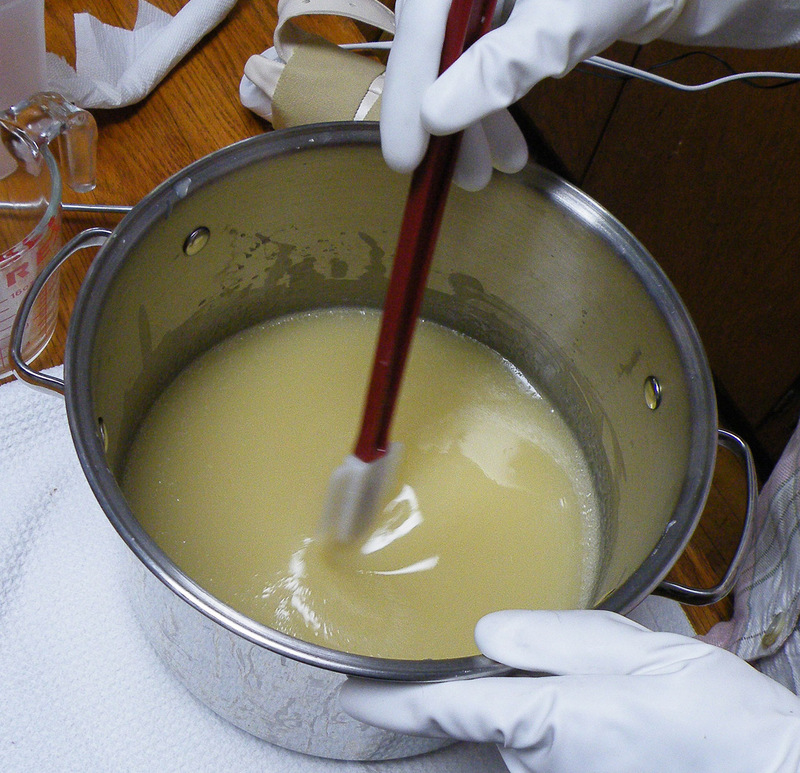 To strain tallow or other animal fat once it is melted. 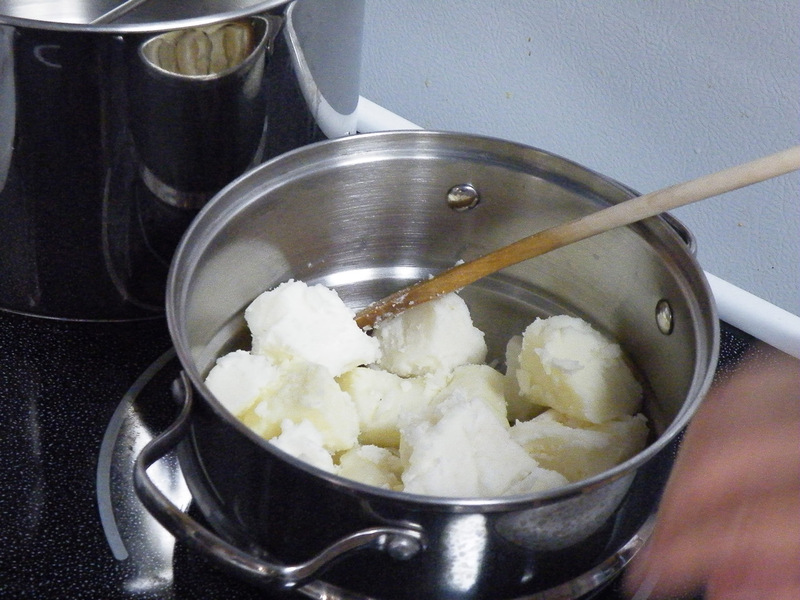 Even though the tallow or lard may be white and look clean, melt it down and strain it anyway. Any bits of debris or specks of meat from the beef, even pinpoint size, that are left may cause brown spots in the finished soap and the potential for spoilage. It’s just one easy step and can make a big difference in the quality of the soap. 8. Molds. Plain high density heat resistant plastic molds designed for soap making are readily available at craft stores. Hobby Lobby has the line “Something Fabulous”. These molds are the first ones I used. Even though I got much better ones later on I still use these for my smaller bars and they are holding up well. However check the molds for any precautions about the highest temperature of hot soap that the molds can handle. The ones from “Something Fabulous” recommend soap be cooled down to 145F. Another option which I also use is a plain rectangular pyrex baking pan. A 10” x 13” that is 2 inches deep can hold 5 pounds of soap. For less than that amount the soap will just be a thinner layer. The soap is difficult to cut and remove in nice pieces from the pyrex pan. I let it cool about two hours at room temperature. Then I cut it and remove it to drying racks. It is easy to reshape any jagged edges at this point because it is still slightly warm and a bit soft. 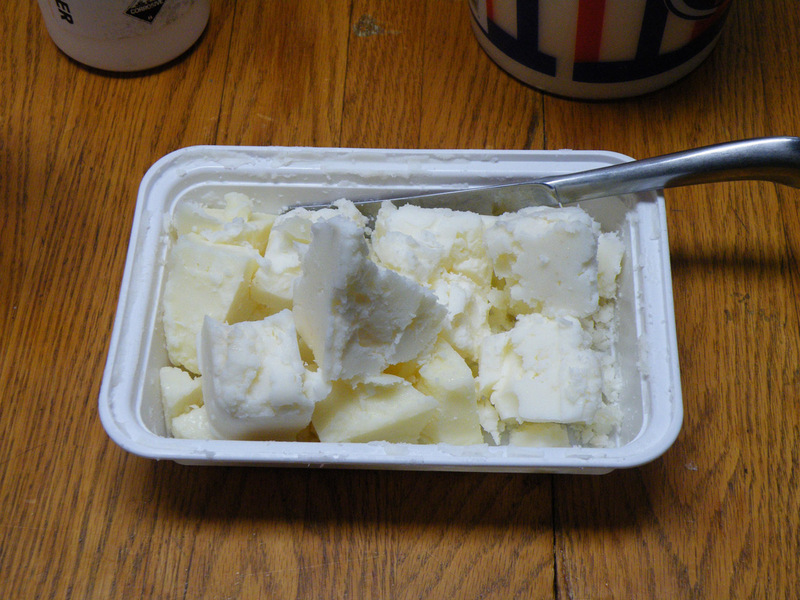 22 oz tallow – Tallow is beef suet that is rendered (cooked and strained). 10 oz olive oil – “Pomace” olive oil, but plain olive oil works too. 10 oz coconut oil – I buy it in a 5 gallon pail and repack it so it is easier to store in the refrigerator. Set oven temp to 180, check oven temp with thermometer. Line stainless strainer with cheesecloth folded 4 layers. Melt beef tallow in saucepan. 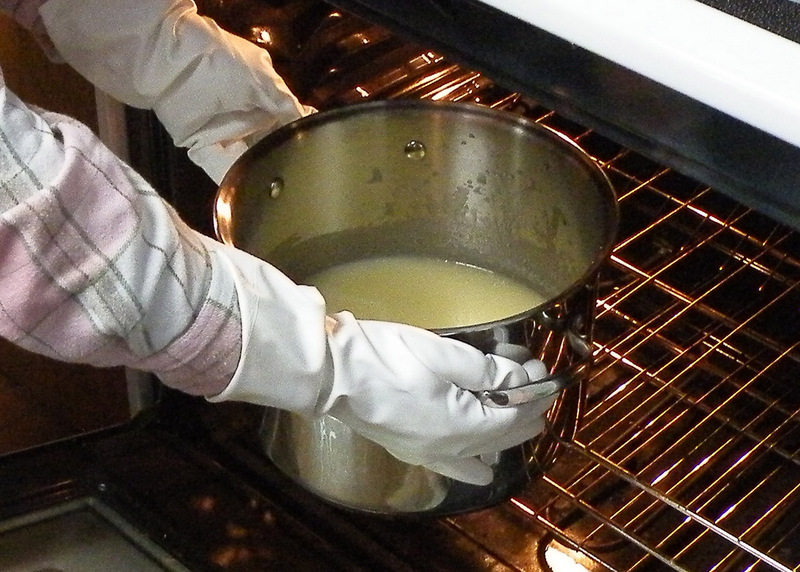 Shut off heat for tallow and let it finish melting to avoid overheating. Measure olive oil and add to large kettle. Tare scale for glass container to measure lye crystals. With safety gear on measure lye crystals. Pour melted tallow through cheesecloth lined strainer into large kettle. Put heat resistant large pitcher into a sauce pan filled part way with cold water. Place candy thermometer into pitcher. Pour the measured distilled water into this pitcher. Slowly pour the lye crystals into the pitcher while stirring constantly. A wooden spoon may be used but they will deteriorate after several batches of soap. Keep an eye on the temperature. The fats should be within ten degrees above whatever the lye is. For Hot Process Oven Method the lye water should be about ten degrees cooler than the hot fat/oil mixture, otherwise the lye water may splatter when poured into it. I add the lye water when it is around 150F and the fat/oil mixture is about 160F. 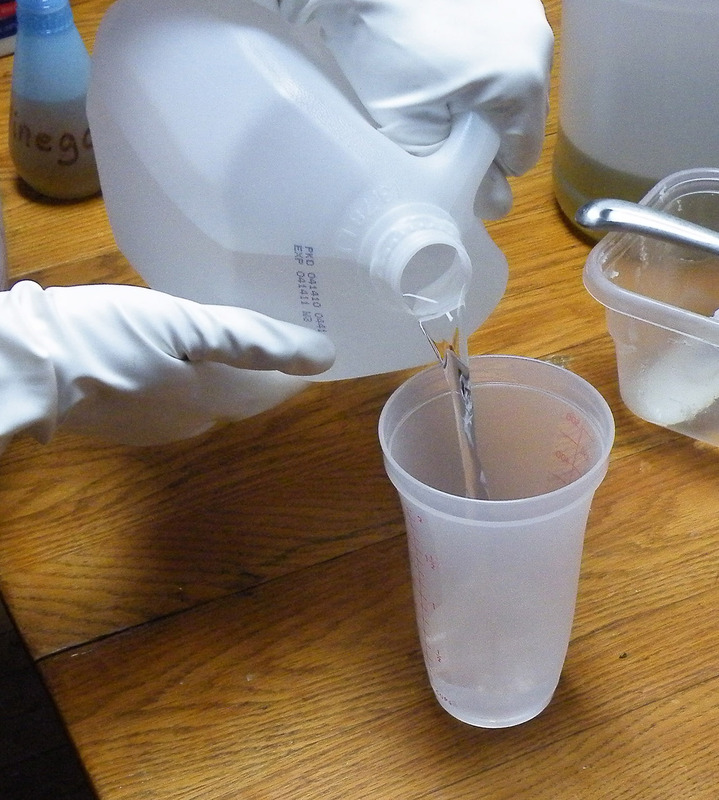 Stir while carefully pouring in the lye water. It can be cooler than that but works best no lower than 95F for the lye water, at least in the recipes I’m doing. I’m sure someone will say differently. Just try it and see what results you get. When the pitcher of lye water is empty, spray down the inside of the pitcher, the spoon and the thermometer with vinegar. This will neutralize the items so they can be safely rinsed later. 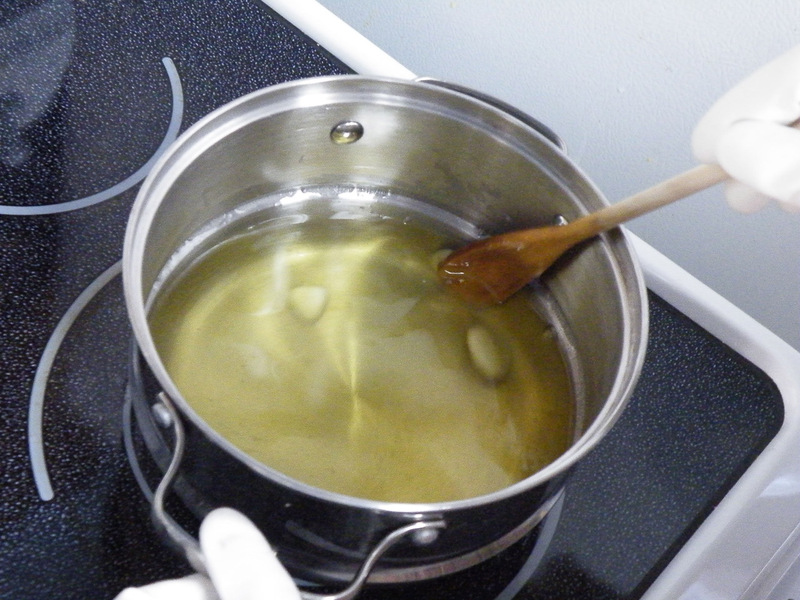 Continue to stir the fat/oil/lye water mixture for about 5 to 10 minutes. It will begin to thicken. One sign to look for is what is called trace. In the soap mixture is leaving a trail and is thick. If the spatula is held up and the soap allowed to drip on the surface it will make a drop on the surface which will remain briefly before melting into the mixture. This is “trace”, the hot mixture is making a “trace” in the liquid. This means that saponification has started. Place kettle of hot soap in oven. Set oven timer for 1hour. It should be preheated by this point, to 180F. Melt the coconut oil until liquid. Use your fingers or a wad of paper towel and dip it into the melted oil and grease the molds. If you are using a pyrex baking pan it does not have to be greased but plan on cutting the soap and taking it out after it cools no more than 2 hours. 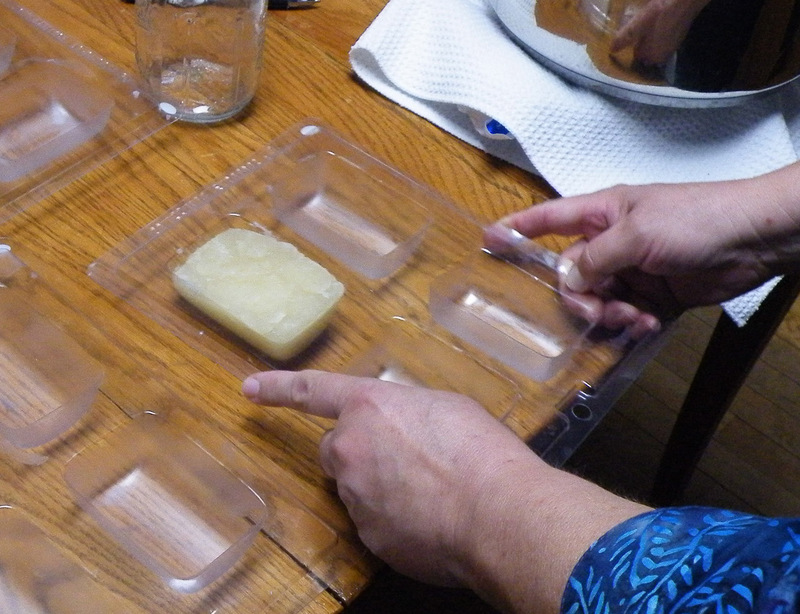 As it cools a white film from the coconut oil will form on the inside of the plastic molds. Some of this will cling to the soap once it is popped out. The bars may have a slippery feel because of the coconut oil residue. It won’t saponify because all the lye has already been used up. If the soap was not fully saponified before pouring into the molds (as in cold process, or an undercooked hot process soap then the soap may stick to the molds). Place the fresh bars onto a cooling rack for several hours. The oil may be absorbed into the bar. If not, just pat any oily spots with a paper towel or soft cloth. Some people recommend spraying PAM or olive oil in the molds. I found this excessive and much of it landed on the surrounding surfaces. I still had to wipe out the excess olive oil that tended to pool in the bottom of the molds. For intricate molds like those with Celtic designs I use an inexpensive new makeup brush. It has lasted through many batches of soap with rarely a lost hair but is pliable enough to get all the fine detail of the mold. Ovens vary. The raw soap mixture may be ready in 50 minutes. For recipes of 2 to 4 lbs the batch seems to be ready by 50 minutes. 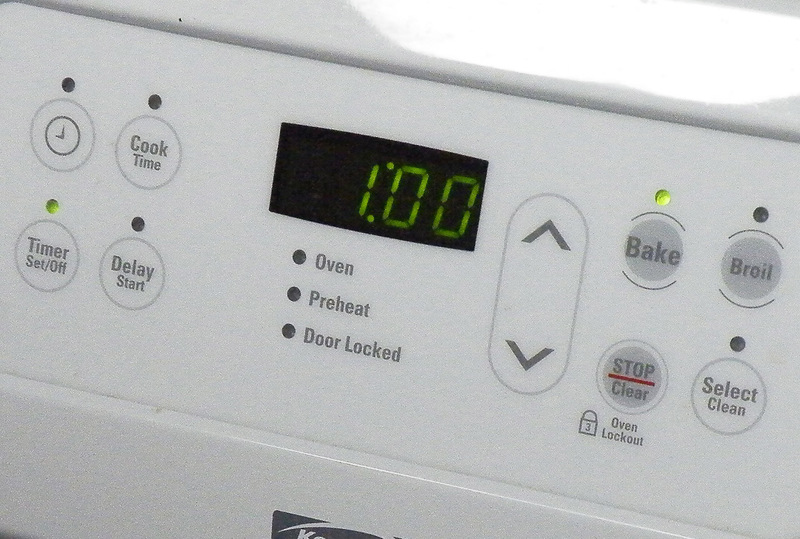 For larger batches of 6 to 8 lbs the oven cook time can be an hour or longer but not more than an hour and fifteen minutes. I’ve not made any bigger than that as it’s too heavy for me to lift. 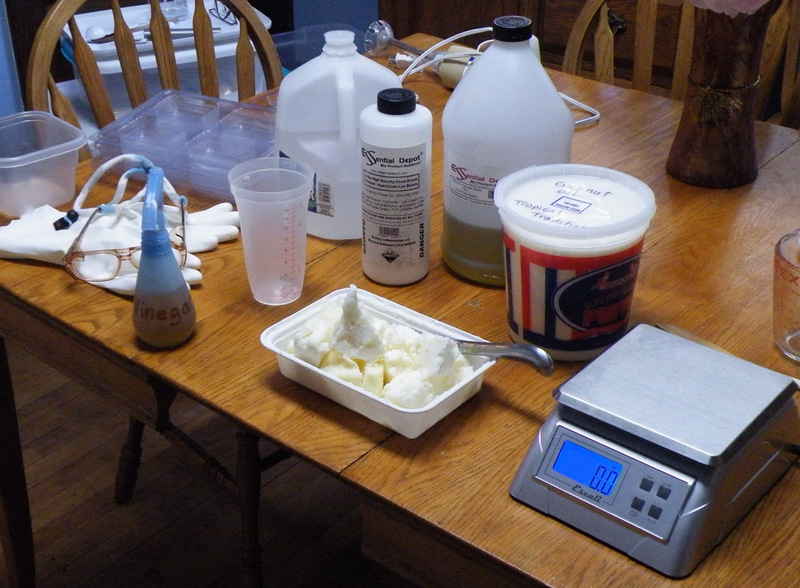 Until you’ve made several batches this is a learn-by-doing process. The worst thing that can happen is the soap will be overcooked. As long as you can stir it, no matter how stiff, work with it. If you think it’s ready to take out and after stirring for a good ten minutes it is well mixed but not getting thicker by the minute, it may not be cooked enough. Put it back into the oven. Keep in mind that it has cooled down while you were mixing it so give it at least another 15 minutes in the oven. Batches differ in how they look and how they cook depending upon what fats and oils are used. The easiest and most predictable for me are the recipes using beef tallow such as the one with this article. Lard, from pig fat, gives a softer soap and I don’t care for it, so rarely use it. I have tried to use every common fat or oil to make soap to see what they are like. Many people are opposed to using animal products and I understand that. But many are using such soap without realizing it. Unless commercial soap is truthfully labeled as “all vegetable” the consumer has no way of knowing that it has NOT been made with animal fat. For myself, I buy the raw beef suet from a local country butcher. It is from one cow or steer only and I get it the day after the animal has been butchered. I take it home and focus upon working with it as the priority for that day. I think about the animal life that produced it and express my gratitude for this gift. I also think about all the people who will use the soap made from it and give thanks that I can make something wonderful and helpful for them from this gift. Our native American people have much to teach us in this regard. I’ve made soap with many different recipes and still get surprises. The biggest one is that my new oven was not reading true to the set temperature. It will register 200 to 215F when set at 180 to 185F. Above that it is accurate to the temperature for which it is set. Also check the temperature at different locations on the rack where you will put the kettle. It can vary as much as 5 degrees from one corner to the next. Sometimes the raw soap mixture will start to generate an internal foam while in the oven and rise up with an oily layer on top of the foam. This seems to only happen to me if the oven temperature gets too high (over 200). This foam should be stirred down quickly or it will erupt over the edges of the pot and onto the oven racks, heating element and oven surface. Using a long handled spoon or heavy duty spatula that is heat resistant stir the foam briskly but carefully so as not to splash. At this stage it will still burn the skin from temperature and the lye. After the set time is up, take the soap mixture out of the oven & stir it briefly. Alternate with the hand blender, using it in short bursts on low speed to spare the motor from over heating. In the two photos showing the stick blender the top portion where the motor is has been adapted with an additional grip made of special heat formed plastic and fastened with Velcro tape. This adaptation was done for me by an occupational therapist at a local hospital and is a real joy to use. This adaptation makes it possible for me to hold the blender without it slipping out of my hand. Before I was not able to grip the blender while also manipulating it around the hot kettle when the soap mixture became thick. If you have a hand or arm disability consider asking someone to adapt the hand blender you use as it will keep it from dropping into the hot soap mix if it slips. Before mine was adapted I dropped it several times and once had hot raw soap splattered all over the kitchen table, cabinets and floor. If hand grip is weak get some pipe insulation foam tubing from a hardware store and put a piece around the handle of the mixing spoon, taping in place. This will increase the surface area and help make your grip more secure. You don’t want the spoons or spatulas slipping while stirring. The soap mixture becomes very heavy and at that point it is too much for the hand blender and a thin, narrow spatula or spoon handle will slip easily or be painful to a hand that already has issues. At this point you have to keep moving the soap mixture so comfort needs to be planned for ahead of time. 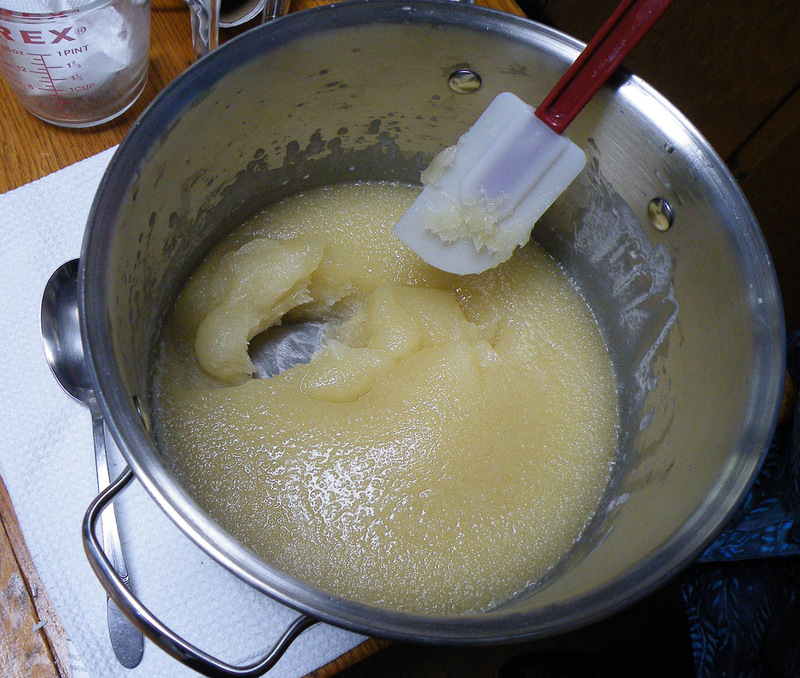 As the stirring continues, the soap mixture should take on the look of applesauce. Continue stirring. If you use the hand blender here only do quick bursts once around the kettle. Lumps of stiff soap will form wherever the blender churns. This is a key to stop with the blender and finish with a spatula or spoon. 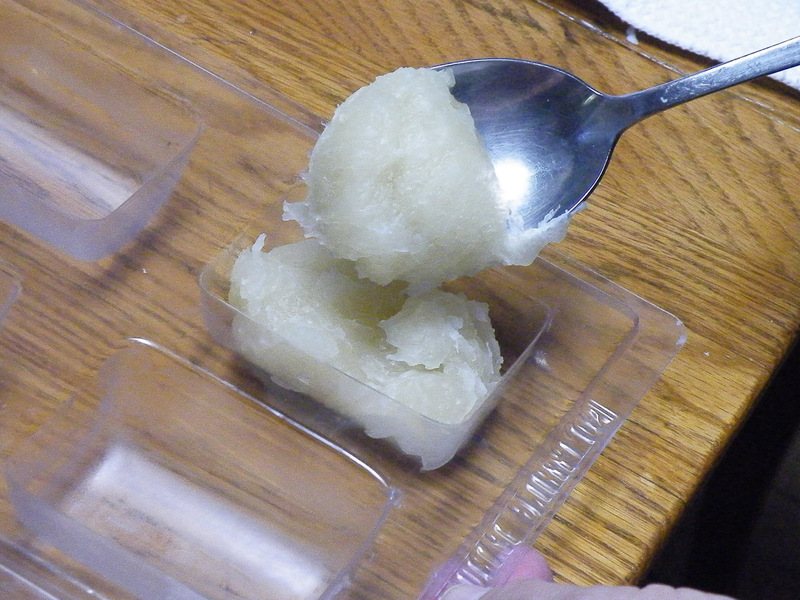 The soap will get thicker and plastic feeling rather than mushy like the applesauce. As the mixture is stirred it becomes so stiff that stirring is more like folding egg whites. The mixture then develops a glossy sheen with each pass of the spatula. The vegetable oils in this recipe help the soap look somewhat translucent. At this point I add essential oils, and any herbs or other oils for superfatting. For this recipe however at this point the soap mixture is ready to go into the molds. As each mold is filled tap the mold tray on the table to settle the soap and force out air bubbles. Level the soap using a broad butter knife or short frosting spatula. Let the filled molds sit at least several hours. To remove them simply turn over and working from the backside gently press the center of one soap while pulling gently on the edge of the mold in that section. The soap should pop out easily. Once the soap is all unmolded place the new bars onto a drying rack or clean cloth. Scrap the excess off the molds and shape into a ball. Use this to wash your hands and see what the new soap is like. Save all the scrapings from trimming bars of soap, cleaning utensils and kettles. These can be used for laundry soap. See the article on making homemade laundry soap. Even though I’ve made many, many batches of soap, I still make mistakes and sometimes it’s hard to figure out what I did. The biggest one is taking the soap out of the oven too soon. It doesn’t get from applesauce to the mashed potato appearance. I keep checking the temp. If it gets below 160 F and it hasn’t turned stiff, then I find it won’t. 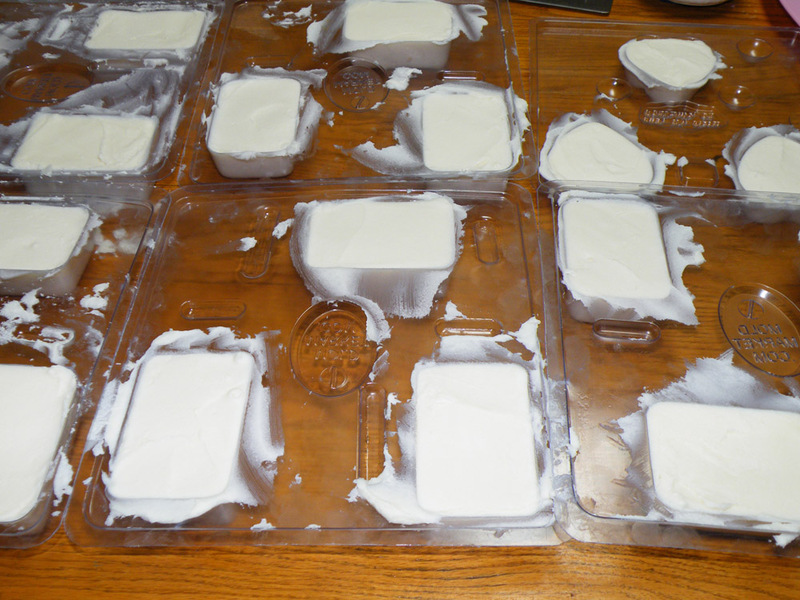 I then just pour it into the molds, tap them to remove air bubbles, level them, and let them sit undisturbed. They will need to sit undisturbed for several days. Often by the second day they will no longer zap your tongue if you test a tiny bit of it. Scrape some of the excess soap from around a mold and use it to wash your hands. If the specks of soap produce a nice lather, then the soap is okay. The soap may be done saponifying, but it may not be dry enough to unmold. Give it several days undisturbed with plenty of air cirulation. When I have a batch like this I pour a few small guest soap sizes to use for testing doneness. If a soap zaps your tongue, and is also undercooked, the best mold to use is a flat pyrex pan, or lined wooden box or plastic box mold. The plastic bar molds, even well greased, will produce bars that are nice and some that have rough surface because of sticking to the mold. One batch like this I scraped out of the molds and hand shaped the soft soap into 2 oz balls. My customers loved these, and to my surprise this new recipe and shape was a hit. Chances are that if the stuff lathers and behaves like soap in cleaning and leaving skin feeling nice, it will sell no matter what it looks like. Bar soap will continue to dry as it ages. Weigh the bars once they are unmolded and the edges are trimmed. My soap will lose as much as 3% when stored for two weeks. Even commercial soap shrinks as it ages, which is why soap wrappers are often loose. This is why the weight indicated on a soap wrapper is understood to be the weight at the time of manufacture. It can be almost a half ounce lighter by the time you get it. This does not make it less effective nor decrease its use in any way. For long term storage, wrap the bars individually in waxed paper or plastic wrap and then place them in an airtight bag or container. Keep the stored soap below 70 degrees and well above freezing. Making homemade bar soap is exciting and a lot of fun. It also teaches us how to get by on less while addressing our family’s need for a safe but effective product. Individuals without internet access should check out local libraries or internet cafes to get to the website links in this article. Or check out the library craft section for books on soap making. Stores like Hobby Lobby which have a large section devoted to crafts have mostly materials for what is called “melt and pour” soapmaking. They have bulk blocks of finished soap that can be cut down, remelted and poured into molds to make attractive shaped bars. These molds can be used for hot process soap also as long as the hot soap is cooled before spooning it into the molds. But it is difficult to get nice bars this way without air pockets. So if you don’t mind the rustic look, and want to use plastic molds, select those with simple designs for easy release of the soap. The best molds are pyrex baking pans you may already have. Use a metal pastry “scraper” to cut the soap. This thin blade item has the same thickness for the whole piece. Knives are thinner at the sharp end than at the top edge of the knife. This makes cutting fresh soap difficult. Silicone baking pans for candies make nice guest soaps, but the surface will not be glossy even if the soap is glossy otherwise.